Tomas Sanchez, founder of Laredo. Image available on the Internet and included in accordance with Title 17 U.S.C. Section 107. A late 18th century map detailing Laredo and Dolores in Santander County. Image available on the Internet and included in accordance with Title 17 U.S.C. Section 107. Sanchez Monument in Laredo. Image available on the Internet and included in accordance with Title 17 U.S.C. Section 107. SÁNCHEZ DE LA BARRERA Y GARZA, TOMÁS (1709–1796). Tomás Sánchez de la Barrera y Garza, founder of Laredo, son of Tomás Sánchez and María Josefa de la Garza, was born in the Valle de Carrizal near Monterrey, Nuevo León, in 1709. As a young man he served in the army of his king and later ran a ranch in Coahuila. When civilization pushed northward to the Rio Grande and José Vásquez Borrego established his ranch and headquarters at the Hacienda de Nuestra Señora de los Dolores on the north bank, Sánchez opened a ranch on the south side within sight of the new settlement. He was residing there in 1754, when he petitioned José de Escandón for permission to found a town on the north bank of the river. 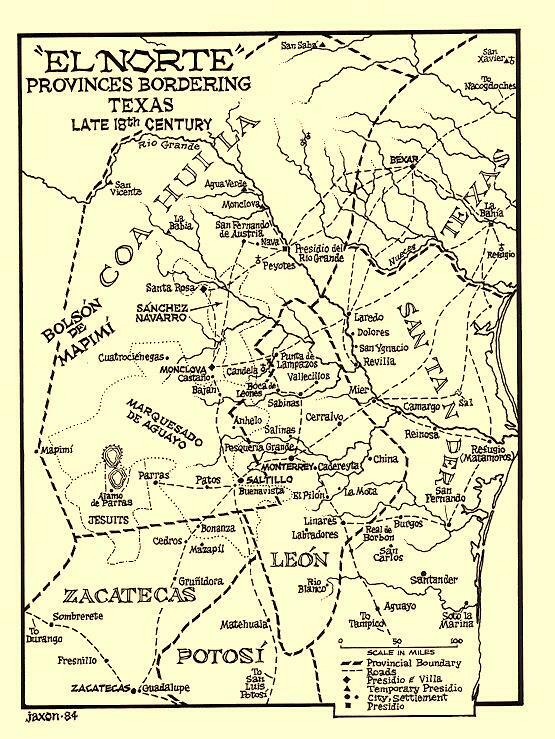 Escandón wanted a settlement on the Nueces and told Sánchez to explore that area to determine the feasibility of establishing a colony there. 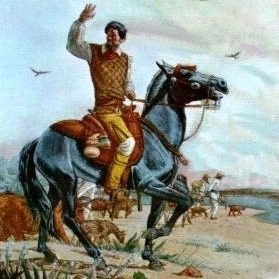 After a reconnaissance Sánchez reported that he found no site fit for settlement and repeated his request for permission to locate a villa ten leagues north of Dolores near Paso de Jacinto, later called the "Old Indian Crossing," near Fort McIntosh. Escandón approved the request and appointed Sánchez captain and chief justice of the new settlement, to be named Laredo. On May 15, 1755, Sánchez founded Laredo with his family and several others. In 1767, after settlers had received ranchlands and a charter from the Spanish crown, they elected as alcalde José Martínez de Sotomayer; but because of his lack of courage to defend against Indian attacks and his attempt to remove the settlers to the south of the Rio Grande, he was removed from office and replaced by Sánchez. Sánchez was almost singly responsible for maintaining the settlement on the north bank of the Rio Grande, and he held the offices of chief justice and alcalde with only brief intermissions until his death in January 1796. He married Catalina (Catherina) Uribe, and they had nine children. With his second wife, Teodora Yzaguirre, he had two children. On October 16, 1938, the Texas Centennial Commission erected a monument marking the site of the founding of Laredo by Tomás Sánchez. Herbert Eugene Bolton, Texas in the Middle Eighteenth Century (Berkeley: University of California Press, 1915; rpt., Austin: University of Texas Press, 1970). Herbert Eugene Bolton, "Tienda de Cuervo's Ynspección of Laredo, 1757," Quarterly of the Texas State Historical Association 6 (January 1903). Carlos E. Castañeda, Our Catholic Heritage in Texas (7 vols., Austin: Von Boeckmann-Jones, 1936–58; rpt., New York: Arno, 1976). Laredo Times, October 19, 1938. Natalie Walsh, The Founding of Laredo and San Augustine Church (M.A. thesis, University of Texas, 1935). Seb S. Wilcox, "The Spanish Archives of Laredo," Southwestern Historical Quarterly 49 (January 1946). Handbook of Texas Online, Winifred W. Vigness, "SANCHEZ DE LA BARRERA Y GARZA, TOMAS," accessed April 23, 2019, http://www.tshaonline.org/handbook/online/articles/fsa19. Uploaded on June 15, 2010. Modified on April 26, 2017. Published by the Texas State Historical Association.